How long can an astronaut, in this type of space walk, last without refueling for Oxygen? I cannot remember which EVA it was, but one astronaut was over exerting and used up a large amount of oxygen. They went into the airlock between task to recharge. The spacewalkers worked outside the International Space Station in U.S. spacesuits at an average altitude of 250 miles above Earth. I’m just curious. What debri would be found outside and on the space station? But to be able to walk outside would be an experience like no other. Congrats to all countries involved to make this work. Great to see your dreams come true. 1) What steps have been taken to insure that these lithium-ion packages are fire-safe? 2) While space-walks are exciting (and astronauts may actually enjoy them), why weren’t design accommodations made for replacing these batteries from INSIDE the ISS? •	The lithium-ion batteries designed for use on the International Space Station are built in an enclosure designed to contain any potential fire. •	NASA has performed tests to understand the risks associated with batteries and has rigorous controls in place to limit potential hazards from lithium-ion batteries. •	The space station’s batteries also have extensive control systems on them that monitor the individual lithium-ion cells and ensure they are performing safely within limits. Understandably, the newer batteries are lighter. But, in zero-gravity, is that any advantage? Also, Rechargable Lithium-Ion’s are known to have a much less amount of recharge cycles. (1200 vs. the original Nickel-Hydrogen’s 20,000?) And lastly, aren’t they known to be much more capable of overheating and potential explosion during charging? Still amazes me what we are capable of when we put our mind to it. March 29th wil be an awesome day. Stay safe. Spacewalkers have a drink bag in their suit they can sip from with a helmet. Astronauts do not take showers but instead wash themselves with damp cloths to conserve water and prevent water from splashing everywhere due to the lack of gravity. Amazing work done by our great astronauts. I just read a story that said two women would be involved in the space walk. Was that not correct or was there a change? How much weight can the Canada arm move? Please provide info. About canarm2 robotic arm sir. what are the debris as described in space ! huge congrats. To all scientist and the states involved in the mission . Personally, I think we need to re-launch lunar exploration now that space tech has improved, maybe have a woman leave her mark. Look perhaps at working long-term (or perhaps living) on the Moon. Our astronauts from all over this beautiful planet have done a WONDERFUL job with all their work from the dawn of the Space Age. Look at where we were to where we are. None of this would have been possible without cooperation (not only within our own country, but others as well). Thank you, astronauts, wherever you all are (and to those we have lost). Please keep up your amazing work in the name of humanity. What is the spacesuits glove thickness? Also how do they harness them selves so the can counter the motion due to the forces they apply while working? The spacesuit has two other sets of gloves that astronauts can use. Comfort Gloves are worn under the EVA glove and aid EVA glove donning, doffing and wicking away perspiration. They provide some additional thermal protection. Adjustable Thermal Mittens provide added protection in extreme temperature environments. Thermofoil heaters are attached inside each of the fingertips in one of the layers of the glove. The heaters are located approximately over each of the crew member’s fingernails. The heaters have an on-off switch near each of the gloves’ wrists. 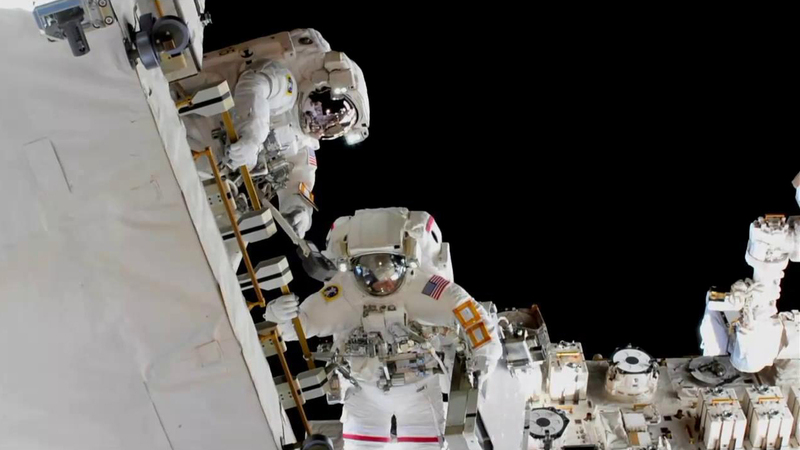 The spacewalkers are tethered to the space station at all times. Their spacesuits have jet packs they can use to maneuver back to the station in the unlikely event they become untethered. Hi! Mark. Have never spoken to an Astronaut especially whilst in Space… I have always had an interest in the Space Program. My question is…on Re-entry, is it a tense time for the crew and does it put lots of pressure on the Capsule? Does the Apollo 13. Movie portray this as the way re-entry actually happens? Thank-you.